Typed Up With Tony Mac – “Daddy Sark (Doo Doo Do Doo)”! Like the tide of the ocean, Alabama washes over everything in its path, often leaving remnants behind of anything that dared to get in its way. In some cases, again, like the ocean, when the Tide recedes, it leaves part of itself behind. 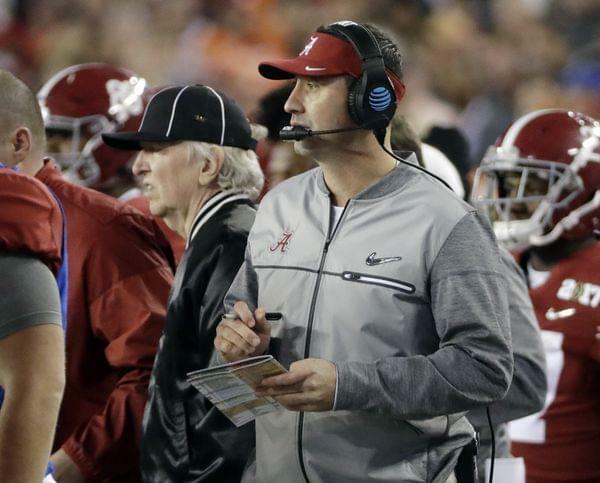 In 2016, Alabama left Lane Kiffin behind after he was ill prepared for the National Semi-Final against Washington. However, there was a hypothetical vicious animal, waiting in the depths, which was said to annihilate anything that dared to get in its way: Steve Sarkisian, or in this case, Daddy Sark (doo doo doo). Instead, Sarkisian (shortly after losing the only game in which he called plays for Alabama) quickly fled to the NFL. During the two years that Sark spent in Atlanta as Offensive Coordinator, he did something that impressed everyone that bared witness to it (well, except for Atlanta fans). Steve Sarkisian somehow managed to take the best offense in the entire NFL (33.8 ppg) and make them wildly mediocre. In his two years as OC, Atlanta averaged 22.1 ppg (15th) and 25.9 ppg (10th). I get it, a top 10 offense isn’t THAT bad. I mean, hey, they were decimated with injuries in the run game and blah blah blah. You won’t get any sympathy from me. They had Matty Ice, 2016 MVP, Julio Jones AND rookie stud, Calvin Ridley! Even though Sark had a top 10 offense, he was still fired and shipped out of the ATL with no complaints coming from their fans. Now, he’s supposed to be THE GUY in Tuscaloosa? Let me ask you something, Alabama fans: Is this the guy you want calling plays when you still have guys like Tua, Jerry Jeudy and even Najee Harris? The obvious answer is no. This is clearly a desperation move by Nick Saban. Although, you can’t blame him when assistant coaches are dropping like flies in Tuscaloosa, but this still feels desperate even in Saban’s current situation. Atlanta fans couldn’t wait to chase Sark back to the ocean and let him once again be swallowed by the tide. I guess the real question we all have to ask is simple: Which Daddy Sark returned to the ocean? Is it the one that lost his killer instinct in Atlanta, the same one that could potentially slow down the otherwise imminent destruction of the rolling tide? Or will it be a Sark that is recharged, one that will only deepen the impact the Tide has on its enemies when it comes rolling to shore, sinking its teeth deep into its enemy, leaving nothing but fear and the memory of a force that shows no mercy? 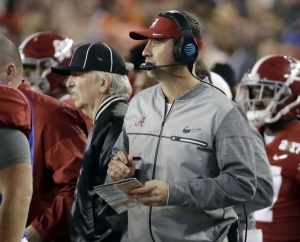 The merciless Sarkisian is the one that Alabama needs, but it’s one of those instances where I would have to see it to believe it. My opinion? Sark lost his killer instinct a long time ago, and now it’s only something that will soon be left behind, again, washed up by the unforgiving tide once it returns to shore.